The war ended only in 1995. People make a living somehow, they probably, most certainly love their home country. They didn’t just rebuild that bridge in 2004 to make tourists come and visit. Mostar is a place where real people live, they are not actors employed to entertain day visitors. The victims of the war still work their way through the consequences of it, and there are many bombed out buildings still. There are of course plans to restore destroyed buildings, like the famous Staklena banka, the Glass bank but it takes time and costs money. It would be a positive action; it is time to move on. People shall not live forever in a town with bullet holes in buildings. It is horrible to see what a war can do. I have seen it on TV and in films. This is a recently destroyed city. This is reality. Maybe it is best to tear down the destroyed places, and have a fresh start. They surely are an amazing playground for future architect visionaries. Mostar is a rather small town; you can walk pretty much everywhere. It is not really busy and seems a bit more on the sleepy side. I still don’t understand at all why they aren’t Yugoslavians anymore, like it was before the war. Again, as so often in history, a few individuals were able to manipulate people, spread hate and start a war. And I imagine it to be so exhausting for the people living in this part of the world to find out who they are or what they shall be, and that every day. People must surely wonder what to do now; they can’t stop analysing things and simply stop looking for solutions. They all lived peacefully together. It would have been fantastic if all the countries of the former Yugoslavia would have stayed together as equals, and form one democracy. At one point they all join the European Union, whose motto is: “United in Diversity.” Many questions are left unanswered. I’m sure there must be many different ideas, answers and opinions. When I arrive in Mostar I can’t believe what I find, and honestly I expected everything but street art. That there is so much street art everywhere surprises me tremendously. There is a massive street art scene in this small town with a population of only 100,000. And obviously there is so much optimism and hope. People actively care for their town, not for one moment do I have the impression they neglect it. See for yourself, it has a magnificent vibe. I see posters, advertising the Street Arts Festival in Mostar. A guy at a café tells me that this year it is the fifth festival, with around one hundred international and local artists. Everybody can join, no matter their age, hair colour or ethnical background. It doesn't even play a role whether artists are professionals or beginners. 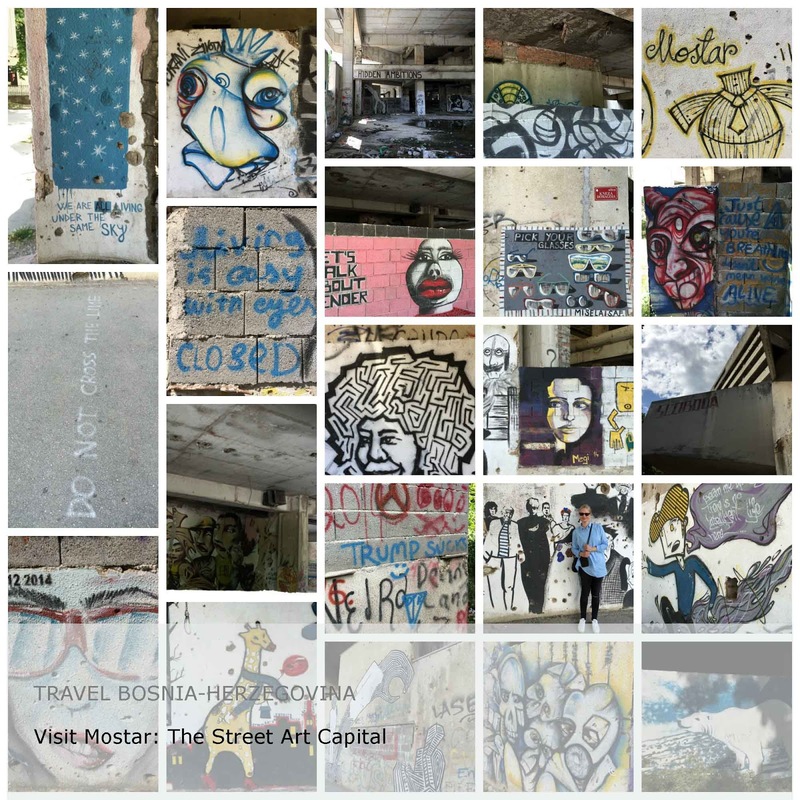 Jump onto the Street Art Festival Mostar fb page for more information. Streets: Alekse Šantića. Bulevar. You will see the Staklena Banka building (aka Glass Bank or Sniper Tower), everybody can enter as long as one can climb over a wall (Kneza Domagoja/Kralja Zvonimira). You also find street art at the Youth Centre: OKC Abrasevic, Alekse Šantića 25. 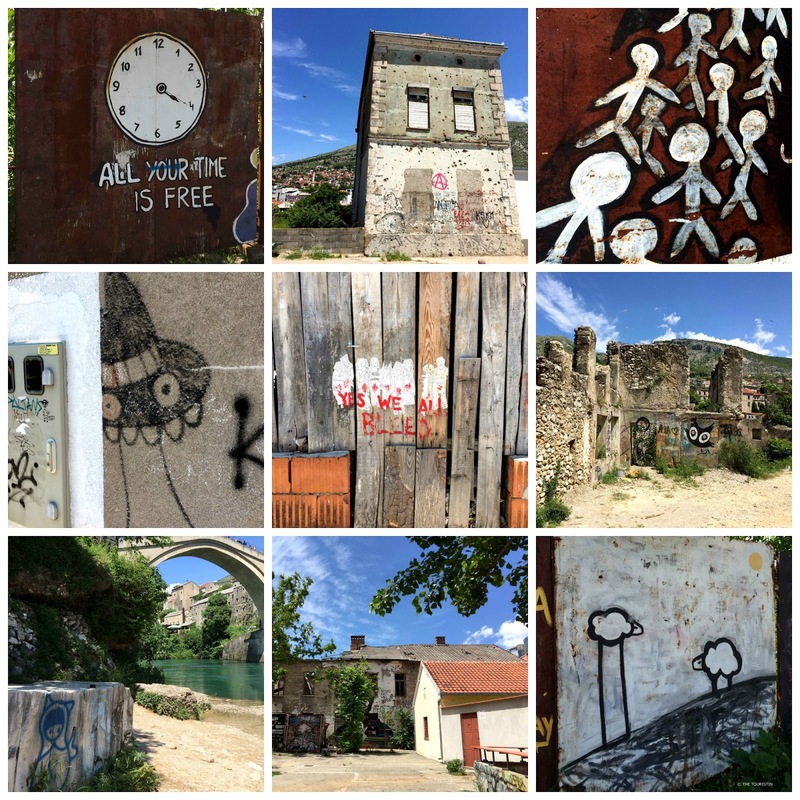 What did I learn in Mostar? After I walked around town for a few hours I go to a restaurant near that bridge. Waiters are dressed in fancy dress, they call it traditional costume. The food is yummy, and the waiter chatty. I notice that nearly every diner takes a photo of the fountain in the middle of the restaurant. Since I can’t see the point I ask the waiter what is so special about this fountain. He smiles, a cheeky smile “Nothing. It is one of these ones you find in mosques that provides water for ritual ablutions. This one is very obviously a replica. I have no idea why they take a photo of it, but you know, as long as it makes them happy, let them do it.” The waiter could barely finish his sentence, when a guy sitting at a table nearby asks him whether he has a moment to stand next to the fountain because he would like to take a photo of him. Hi Joy, thank you. I would love to visit Warsaw and Krakow too, and I really hope to visit soon. You live in the very best place for street art, Melbourne is where my love for street art grew bigger and bigger.